With it being two days to Easter and the beginning of the bunny breeding season, I couldn’t think of a better time to talk about rabbits. For the last five years, we have watched a family of rabbits in our backyard. If you look out the window after dark, you will see them eating the clover in our front yard. In the early morning, you will see them drinking at our pond. We have had the privilege of watching mommy with her babies playing in the yard. She made her nest under the back deck and we make sure that nothing changes to affect her home. Now that we have the cottage, we see rabbits scampering around in the fields and the lawn near the cottage. It seems kind of silly after this many years to still get excited when we see them, but we do. One of us will always point out to the other, the bunny is out in the yard. I would say it’s fair to say, the bunnies have a soft spot in our hearts. Here in Southern Ontario, We have the Easter Cottontail. The bunny breeding season starts in the month of love, February and continues to until September, with the first litters being born in mid-April. The females, know as the Doe, can have three to four litters a year. Each litter producing three to five babies with as high up to twelve in one litter. Baby rabbits are called a Kit, which is short for a kitten. The Doe goes into heat, the day after she delivers her litter, getting ready for her next litter and produce an average of fifteen offspring a year. The early Spring baby can have a litter her first year of life. When going out to mow the lawn, take a walk around. If you find a patchy brown spot, leave that area alone for a couple of weeks. It may be a nest. 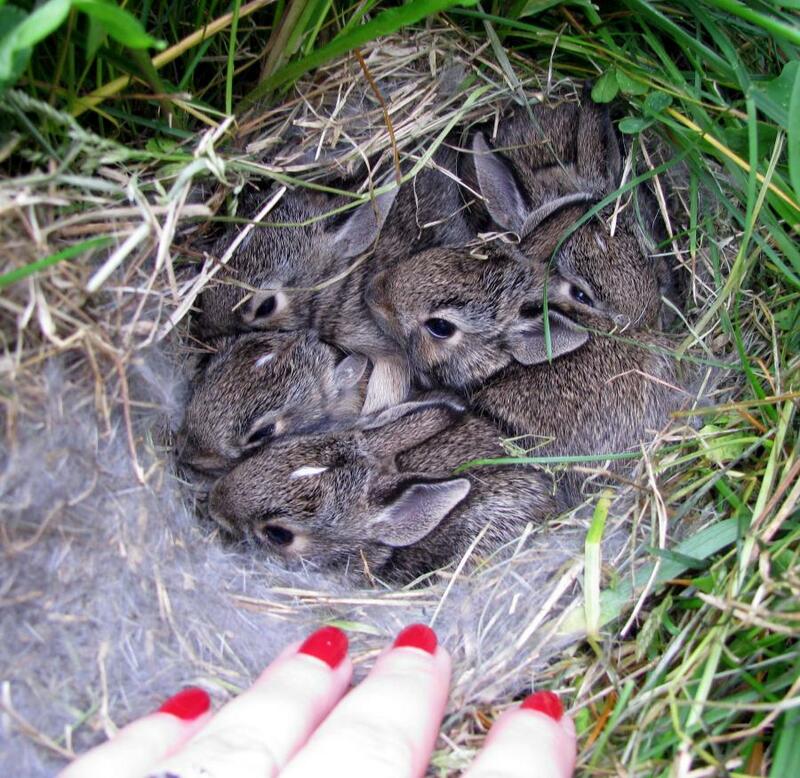 Bunnies nest in the lawn. Eastern Cottontail Rabbits expectant mothers burrow a shallow nest in the ground creating a depression in lawns and fields. They line their nest with grass and her fur to keep the young warm and covered. The mother rabbits, won’t be seen often. She only returns to the nest once or twice a day to feed her young, normally at the crack of dawn or after dusk. She avoids the nest during daylight hours trying not to attract predators to her young. The good news is, you will be able to mow your lawn in a few weeks as they don’t stay long. The new bunnies leave the nest in four to five weeks. Like the rest of wildlife, insecticides and herbicides are dangerous to rabbits. Their diet consists mainly of leafy plants, buds, twigs, bark, flowers, grass seeds, sedge fruits, and rush seeds. They also like to eat the garden vegetables and fruit humans love to grow. 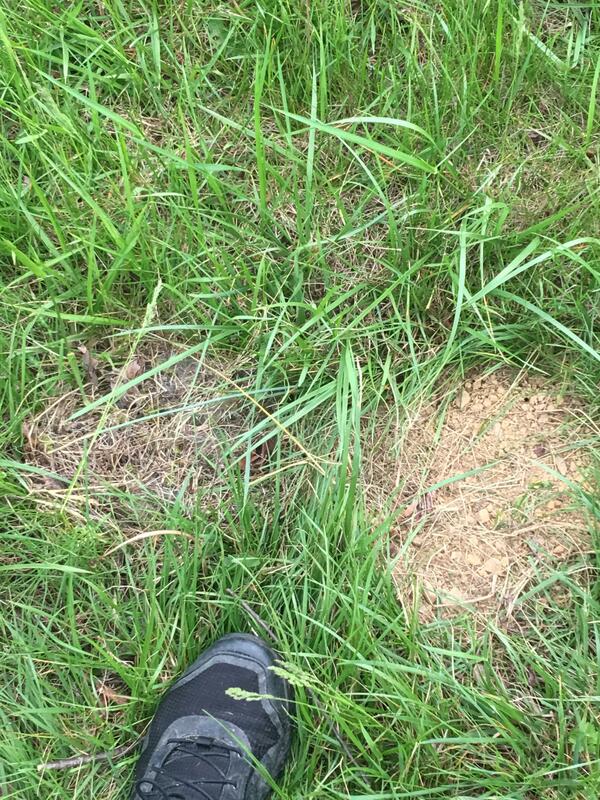 The insecticides and herbicides eaten by the rabbits can poison the rabbit and also her Kits. The poison is absorbed into her blood system which passes through her milk and can quickly kill her vulnerable nursing babies. If you come across a nest, don’t touch it. Just because you don’t see mommy around does not mean the babies have been abandoned. Keep in mind that mommy is there when you don’t see her. If the babies look plump and well, she is coming back to feed them. If you are concerned that the mother is not feeding her young, sprinkle flour around the nest. When you come back to check for footprints and there are none, or the young appear lethargic, they may be orphaned. Don’t try to feed them yourself. Call the animal control to come and take care of them. They need special food that humans don’t have and our food can kill them. Please keep Fido away from the next. Our loving dogs have a hunting instinct and your kind loving pet can turn quickly into a predictor. It is interesting to show our children nature at its best. When doing this consider that the wild rabbit is not a pet and cannot be checked on daily, handled or fed. The best lesson is to teach children to see, but not touch. Some adults can still learn that lesson too. About your garden with those fruits and vegetables that we like and so do the rabbits. The best way to keep them out of your garden is to put up a fence, digging down six inches, so the rabbits can’t burrow under it. It does not have to be a high fence. I guess you are wondering if the average female can produce up to fifteen babies year, why are we not overrun with rabbits in Southern Ontario? The answer to that is, predictors. Even though Eastern Cottontails are incredibly fast, reaching speeds of sixty to seventy-five kilometers per hour. They have numerous predators including domestic cats and dogs, foxes, coyote, bobcats, raccoons, owls, hawks, skunks, and snakes. They have few natural defense mechanisms, with speed and blending into their surrounding be the strongest. The population’s mortality rate is also affected by man. Many are run over by cars, rototilled in gardens and farmers fields and the use of pesticides, herbicides, and insecticides kill many each year. Urban expansion has taught them to be creative and they have adjusted to living alongside us, well. Yet, the survival rate of an adult is estimated at 20% each year. Average longevity is 15 months in the wild. No, they are not the Easter Bunny. But they do stay around much longer and give us much more pleasure. That was interesting – I learned some new things about rabbits. I have not seen any yet this year in the Park where I walk. I see them a lot in the Summer grazing as I pass them on the perimeter path. They are peacefully munching the grass, wiggling their ears which look translucent in the early morning sunshine. Reblogged this on C. T. Suddeth.